It is 1942, America has entered World War II, and sickly but determined Steve Rogers is frustrated at being rejected yet again for military service. Everything changes when Dr. Erskine recruits him for the secret Project Rebirth. Proving his extraordinary courage, wits and conscience, Rogers undergoes the experiment and his weak body is suddenly enhanced into the maximum human potential. Since 2000 we are literally flooded with film versions of Marvel heroes. Just a small list: X-Men, Blade, Spider Man, Daredevil, The Hulk, The Punisher, Elektra, Fantastic Four, Ghost Rider, Iron Man, Thor, Wolverine, The Avengers, Guardians of the Galaxy … Pretty impressive. And this year there’s the release of “Captain America: Winter Soldier” of which I read so many good things everywhere. In preparation for this, I had to watch the first film from “Captain America” so I’ll be proper prepared. Captain America was introduced before World War II by Marvel and was immensely popular among the American troops. That’s because he fought against the Nazis, the Japanese and other enemies of the U.S. After the 2nd World War he fought against communists during the Cold War. After that he sank into oblivion but was summoned back to join “The Avengers“. Unlike other Marvel superheroes he doesn’t have any super powers. He just has those immense muscles to defend himself with. This movie takes place in 1942. 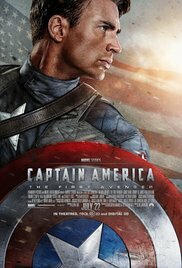 Steve Rogers (Chris Evans) wants to join the army at all costs, to participate in defeating the Nazi regime in Europe. He is far too petite and has a whole catalogue of illnesses. He is rejected while his good friend James “Bucky” Barnes (Sebastian Stan) is approved and about to leave to the front. At an exhibition Rogers attracts the attention of a certain Professor Erskine (Stanley Tucci) who makes him an offer: joining the secret project “Rebirth” where he’ll receive injections and radiations with “Vita”-rays which will stabilize and activate the injected chemicals. His physical appearance changes quite dramatically. That thin, weak little boy changes into a healthy and muscular super soldier. Erskine has chosen him because he’s sure that a weak person will continue to respect this gift and still will show compassion. “Because the strong man who has known power all his life, May lose respect for That power, but a weak man knows the value of strength, and knows … compassion“. But Steve Rogers is the only super soldier that mankind will know because professor Erskine is assassinated and thus the experiment can no longer be repeated. The first half hour was funny and entertaining. The atmosphere of the 40’s was beautiful integrated. A little bit sallow and with that 40’s flair achieved by the costumes and decor. It really had that feeling of a pre-war film. The illusion they created seeing Chris Evans transforming from a toddler to an impressive person is wonderfully realized. Tommy Lee Jones (as the drill sergeant) and Stanley Tucci take care of some funny moments. Even the part where Captain America is used as a living billboard to attract new cannon fodder for the ongoing war, was reasonably entertaining. And then everything starts to look a bit ordinary and Captain America becomes a parody of itself. The transformation of a schmuck into an invincible someone is obviously something the audience loves to see, but the bland and cartoonish second part puts a damper on that grandiose beginning. The fight against the Nazi Johan Schmidt (Hugo Weaving) or Red Skull, who’s in possession of some sort of cube from Odin (crucial in “The Avengers“) which contains a super power that he wants to use to put the entire Nazi regime aside and conquer the world with, is initially enjoyable but eventually decays into a lousy action-movie. I thought it was a poor and incoherent story filled with asinine coincidences. The revue Captain America performs in, happens to move to Italy. Turns out his good friend “Bucky” is kidnapped by Red Skull and sits in the castle that the latter has taken over, to expand his organization “Hydra” and provide them with devastating weapons which work with the occult forces of the captured cube. But despite that almost invincible power, it really is a piece of cake for Captain America to sweep them together on a pile. He waltzes through it as if he is faced with an army of garden gnomes who are trying to defend themselves with tiny weapons. This really looked rather simplistic. One moment Red Skull inspects his troops and before you know it he’s evacuating the castle in a panic, because Captain America came knocking on a door and a German porter on duty became acquainted with his legendary shield. The credibility of the story at that time was like the person Rogers was before he got those chemicals : weak, poor and meager. You can’t call it exciting actually. And it’s as predictable as the fact that Easter Monday will be this year again on a monday. The performances on the other hand are of an acceptable level. Chris Evans is superb as Captain America. The transformation of an insignificant schmuck into a savior and example of braveness for the American people, is simply sublime. Unfortunately his character eventually evolves into a third-rate action figure with an uninspired storyline. Tommy Lee Jones was again irresistible in a role that suits him. A humorless, moody loudmouth with a strong opinion and someone who says his unvarnished opinion. Hugo Weaving was perfect for the role as the dictatorial Nazi Schmidt and archenemy Red Skull. His grim facial features and demagogic madness made me forget to get iritated by his English with an exaggerated German accent. But despite the fine performances, this Captain America was no more than an average action movie. No suspense and totally not impressive. Visually it didn’t look that bad but the story was of a questionable level. Ultimately, it’s only an introduction to the film “The Avengers“. The only thing I could think of was “I hope the sequel isn’t such a dull spectacle as this …..”. I really appreciate your hard work. your web design is much beautiful as your posts. i will definitely visit again to know about free movies online .